With minutes ticking down to yet another transfer day deadline the Harriers manager Mark Yates bought in two young defenders on loan. Michael Wylde was the first to be introduced to the fans this afternoon and then a hour later the next signing was announced as Jake Moult. 21yr old centre half Wylde is the obvious replacement for Luke Jones after he was un-expectedly recalled to Shrewsbury two weeks ago. 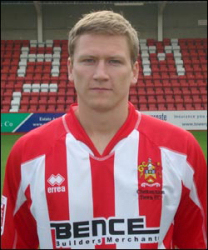 Wylde has made his way here from Cheltenham but he is no stranger to Aggborough after being part of the Youth set up here. He was one of many youth players that followed Graham Allner and Dave Reynolds to Whaddon Road when the former Harriers manager and Supremo went there. His time there has been punctuated with injuries and he missed the start of this season with a broken jaw and has only ever played for the first team four times. 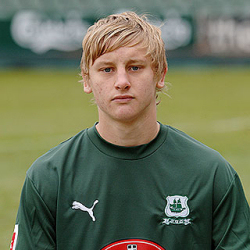 19yr old Moult is also a defender with Plymouth Argyle and also has yet to make a start for his club. He joined the Championship side from Port Vale reserves before the start of this season. Neither player can play against Crawley tonight but are expected to play some part in Saturday's game at Cambridge Utd.